Summary: An intravertebral pneumatocyst is a relatively rare condition, and its natural course and etiology are unclear. We report a case of intravertebral pneumatocysts in the C5 vertebra that gradually enlarged during a 16-month period as documented by follow-up CT. In addition, direct communication was observed between the gas in the intervertebral disk and another pneumatocyst in the C6 vertebral body, which suggests that the gas in the pneumatocyst had an association with the gas in the degenerated intervertebral disk. Intraosseous gas collection is observed in various pathologic conditions, including osteomyelitis with gas-forming organisms, vertebral collapse due to osteonecrosis, and postoperative and posttraumatic conditions. An intraosseous pnuematocyst is, however, a relatively rare condition in which there is a gas-filled cystic lesion of uncertain origin in the bone. Although this condition is most frequently observed in the ilium and sacrum adjacent to the sacroiliac joint (1), a pneumatocyst in the spine is rare, and to our knowledge only eight reports have been published in the English-language literature (2–9). Just two reports, however, describe the natural course of this rare condition (6, 9). We report a case of intraosseous pneumatocyst in the cervical spine that CT showed to be gradually enlarging during a 16-month follow-up period. A 69-year-old woman was evaluated for neck pain of 5 months’ duration. Anteroposterior radiographs of the cervical spine revealed a radiolucent lesion in the C5 vertebral body. Spinal metastasis in the cervical spine was suspected, and the patient was referred to our hospital. 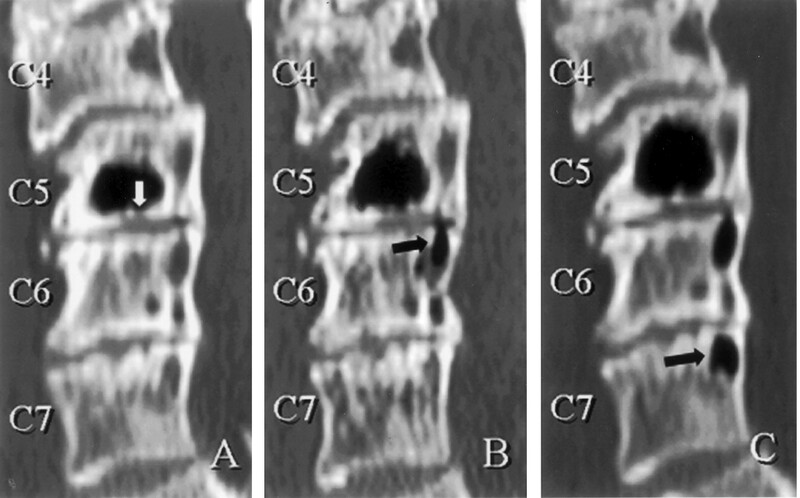 Lateral radiographs revealed moderate to severe degenerative disk disease from the C3–C4 to C6–C7 levels. She did not undergo MR imaging, because she had prior clip placement in an intracerebral aneurysm. Multisection CT revealed an irregular lesion, around 7 mm in diameter, with an attenuation consistent with that of gas (HU = −890), in the C5 vertebral body (Figs 1A, 2A, and 3A). The lesion had a narrow communicating channel (a defect in the bony endplate) with the C5–C6 disk space (Fig 2A and 3A). There was also a small irregular lesion suggesting gas in the C6 vertebral body adjacent to the cranial bony endplate (Fig 4A). Close to this, there was also a small fluid-filled cystic lesion in C6 body (Fig 4A). The imaging findings suggested intraosseous pneumatocysts of the cervical spine. A, Initial axial CT scan shows lesion with gas attenuation (−900 HU) in C5 vertebral body. B, Axial CT scan obtained 2 months after initial presentation shows enlarged lesion in C5 vertebral body. C, Axial CT scan obtained 16 months after initial presentation shows further enlarged lesion in C5 vertebral body. A, Initial sagittal reconstructed CT scan shows lesion in C5 vertebral body has narrow communicating channel (defect in bony endplate) to the C5–C6 intervertebral disk (white arrow). B, Sagittal reconstructed CT scan obtained 2 months after initial presentation shows enlarged lesions in C5 and a new lesion in the C6 vertebral body adjacent to cranial bony endplate (black arrow). C, Sagittal reconstructed CT scan obtained 16 months after initial presentation shows further enlarged lesions in C5 and C6 and a new lesion in the posterior upper corner of C7 vertebral body (black arrow). 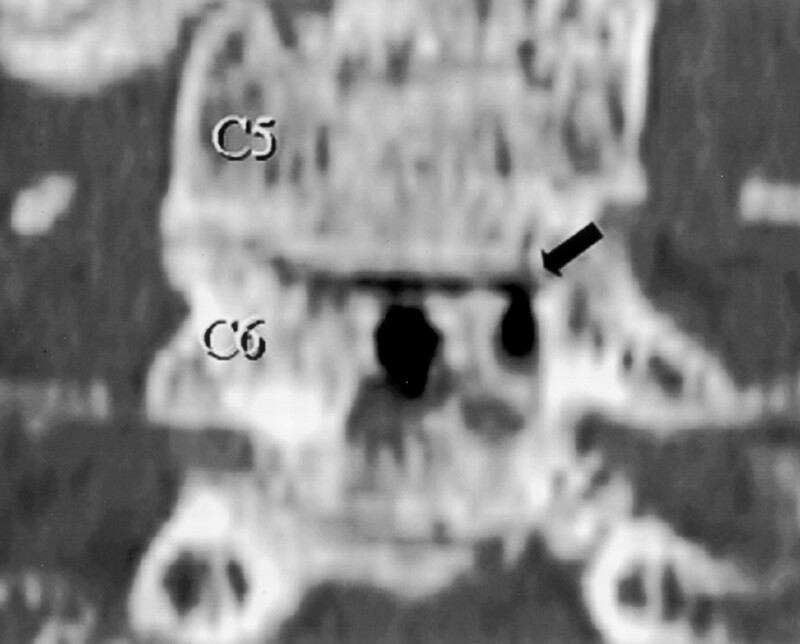 A, Initial coronal reconstructed CT scan shows lesion in C5 vertebral body has narrow communication channel (defect in bony endplate) to the C5–C6 intervertebral disk (white arrow). B, Coronal reconstructed CT scan obtained 2 months after initial presentation shows enlarged lesion in C5. C, Coronal reconstructed CT scan obtained 16 months after initial presentation shows further enlarged lesion in C5. A, Initial axial CT scan at the cranial side of C6 vertebral body shows a small lesion suggesting a gas (pneumatocyst). The next to the lesion, there was also a small fluid-filled cystic lesion in C6 body. B, Second axial CT scan at the cranial side of C6 vertebral body shows a new gas-containing lesion in the C6 body. It seemed that the fluid-filled cystic lesion in C6 body was partially replaced with gas. She was successfully treated with anti-inflammatory agents. A second CT examination obtained 7 weeks after the initial presentation revealed the enlarging lesion in the C5 vertebral body (Figs 1B, 2B, and 3B). Furthermore, new gas-containing lesions in the C6 body were found (Fig 2B). It seemed that the fluid-filled cystic lesion in C6 body was partially replaced with gas (Figs 2B and 4B). One of these lesions seemed to have direct communication with the gas in the C5–C6 intervertebral disk (Fig 5). Follow-up CT scans, obtained 16 months after the initial presentation, revealed that both lesions in the C5 and C6 vertebral bodies were enlarged (Figs 1C, 2C, and 3C). At this time, a new gas-containing lesion was also found in the upper corner of C7 vertebral body (Fig 2C). An oblique radiograph of the cervical spine, taken on the same day, showed a radiolucent area in the C5 vertebral body (Fig 6). Despite these findings at CT examination, she remained in stable condition. Coronal reconstructed CT scan obtained 2 months after initial presentation shows direct communication with the gas in the C5–C6 intervertebral disk (black arrow). Oblique radiograph of the cervical spine, taken at the last follow-up, showing radiolucent area in the C5 vertebral body. To our knowledge, 12 cases of intravertebral pneumatocysts have been reported, eight cases in the cervical spine, three cases in the lumbar spine, and one case in the thoracic spine. Seven of the eight cases in the cervical spine occurred in the vertebral body (2–4, 6–9), and one was located in the lateral mass of the cervical spine (5). 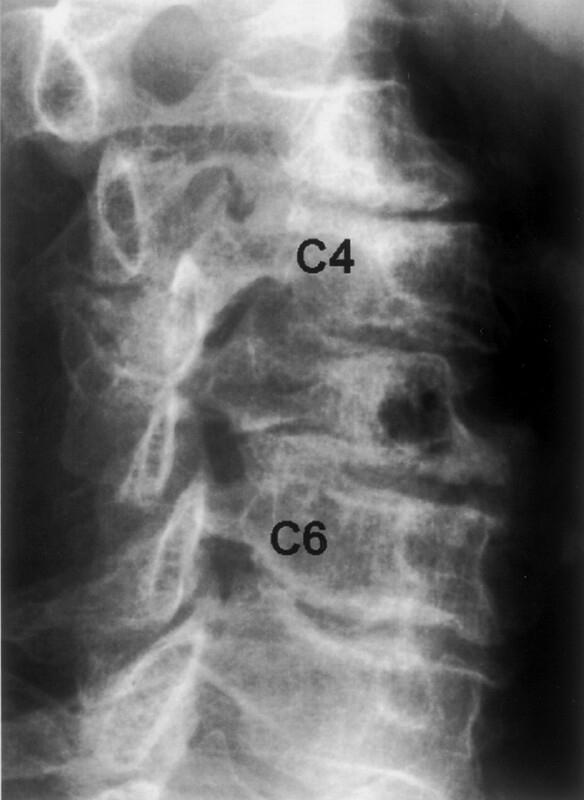 Four cervical pneumatocysts were located in C5 (2, 6, 8, 9), two in C6 (3, 4), and one in C7 (7). Five of the eight cervical pneumatocysts had no communication with the intervertebral disk or the spinal canal, based on the CT findings (2, 5, 6, 8, 9). On the other hand, two cervical pneumatocysts had communication with the spinal canal (4, 7) and one case with a degenerated intervertebral disk (3). The etiology of pneumatocysts is unknown. Laufer et al (5) proposed that the gas was nitrogen from adjacent joints. Ramirez et al (10) suggested spontaneous development of intraosseous gas or secondary gas accumulation in a simple fluid-filled cyst or ganglion. Gas in the degenerated intervertebral disks, known as “vacuum phenomena,” is often observed in the degenerated spine (11). The extension of gas from the intervertebral disk into the vertebral body through a defect in the degenerated endplate might be another cause for intravertebral pneumatocysts (3). The current case is the first one in which direct communication was observed between the gas in intervertebral disk and a small pneumatocyst in the C6 vertebral body. This suggested an association of the gas in pneumatocysts with gas in the degenerated disk, although the origin of the gas in pneumatocysts is still unclear. Laufer et al (5) reported four cases of intravertebral pneumatocysts that were found during a 1-year period with CT. Their four cases differed from eight other reported cases in terms of patient age and the size of the pneumatocysts. The patients’ ages ranged from 33 to 45 years, and CT revealed small and round lesions (2–5 mm in diameter) in the vertebrae without spinal degeneration. In all the other cases, including that of our patient, patients’ ages ranged from 49 to 69 years, pneumatocysts were definitely larger, and spinal degeneration was observed adjacent to the involved level. These facts suggest the existence of two types of intravertebral pneumatocysts. One is the small, round lesion observed in a relatively younger population that has no relation to spinal degeneration. Another is the relatively larger lesion found in an older population that is associated with spinal degeneration. The natural course of the intravertebral pneumatocyst is unclear; it was reported in only three of 12 reported cases of vertebral pneumatocyst. Nakayama et al (6) reported two pneumatocysts, one occurring in the cervical spine and another in the lumbar spine, that spontaneously progressed to fluid-filled cysts 2–16 months after the initial findings. Yamamoto et al (9) reported a case of a cervical pneumatocyst that changed to a fluid-filled cyst and that subsequently may have been replaced with granulation tissue, as shown by MR imaging at 40-weeks follow-up. To our knowledge, our case is the first one in which the pneumatocyst in the C5 vertebra gradually enlarged as documented at 15-month follow-up CT. In addition, new pneumatocysts appeared in C6 and C7 vertebrae. Thus, pneumatocysts can enlarge and may possibly appear in the adjacent vertebrae, although they may later change to fluid-filled cysts. Accepted after revision March 31, 2003.